Fiction – paperback; Hoopoe; 136 pages; 2016. Translated from the Arabic by Jonathan Smolin. First published n 2000 as al-Dhubaba al-bayda by al-Muttaqi Brintira, Whitefly is the first Arabic detective novel to be translated into English. Unfortunately, the book doesn’t have an “about the author” section, so I had to Google “Abdelilah Hamdouchi” to find our more about him. According to this article on Words Without Borders, he was born in Morocco in 1958 and has written several police detective novels with a human rights bent. Whitefly is his third. Set in modern-day Morocco, the book introduces us to Detective Laafrit, a 40-year-old policeman, married with a young child, who is well respected by those he works with, including the Commissioner, who is of a higher rank but treats him as if their positions are reversed. The story follows his investigation into the death of three young men, washed up dead on a local beach over the course of a couple of days. It’s believed the men are harraga (illegal immigrants) who have fallen overboard while trying to reach Spain. When a fourth corpse washes up the case takes on a new dimension, for the man has been shot four times and it’s clear that the leather jacket he’s wearing has been put on him after he’s been killed. Laafrit pins his hopes on finding the gun, because that will ultimately lead to the killer. (Guns are illegal in Morocco and very difficult to obtain.) He uses his underworld contacts to help him find the weapon and to find out more about the identities of the men. Did they all know each other? And, if they did, what is their connection? Why was one brutally murdered? The best bit about this novella is the setting. I’ve not really read anything set in Morocco before (apart from Nina Bawden’s A Woman of My Age, but that was simply about an English character on holiday there) and I found it fascinating to be thrust into unfamiliar territory. I had to do a lot of Googling to find out more about the tense relationships between Spain and Morocco over people smuggling, and to work out why the cities of Ceuta and Melilla were so controversial. Turns out they’re both Spanish territories on the African continent, sharing a border with Morocco, which makes it easier for Africans to enter Europe illegally. I found out other things I didn’t know about Morocco, too, such as the fact that three million Moroccans live on tomatoes as their main food source. The crime itself, which appears to be part of the dark shadowy world of people smuggling and illegal immigration, morphs into something else entirely (involving agriculture, food production and industrial espionage) — and I’m not sure it worked as well as it could have. It was certainly an intriguing concept, but I felt it could have been fleshed out a lot more than the 136 pages that this slim volume allowed. 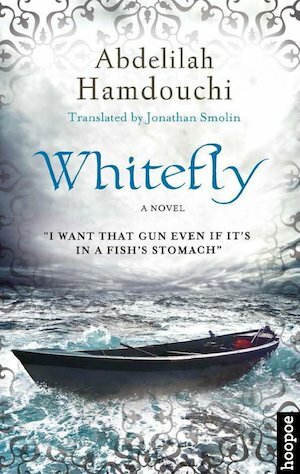 And while I finished Whitefly with a sense of disappointment, I’m going to hunt out more books by Abdelilah Hamdouchi in due course because this novella, for all its faults, was an effortless read and one that evoked a strong Moroccan vibe I’m keen to experience again. Jamal Mahjoub writes under the pseudonym Parker Bilal and has a detective series set in Cairo. Interesting. Zoe Ferrariis has written several detective novels set in Saudi Arabia which are worth a read and are an eye opener. Richard Crompton’s novels, set in Kenya, with his Masai detective are fascinating but I don’t know of translated works. I have enjoyed the above though and found the settings and information about the cultures riveting. Thanks for the suggestions… I will look them up! It’s a shame this didn’t quite work because a lot of it sounds really appealing. I’ll be interested to know how you find his other works. Apologies for delay in replying: I’ve been in Cambodia! While Whitefly had a disappointing (or should I say rushed) ending, the book as a whole was a great read… really insightful look at Moroccan society. There’s a minor side narrative about domestic abuse, which was interesting, although the way it was handled was slightly naive. I’ll keep you posted if I read more by him. My son has just moved to Morocco as a teacher (at an international school). Judging by facebook he’s enjoying himself and doing all the touristy things. He complains “the second hand bookshops here only seem to stock English language versions of Stephen King and Machiavelli..”, so I’m sending him your review. Apologies for delay in replying:I’ve been in Cambodia.